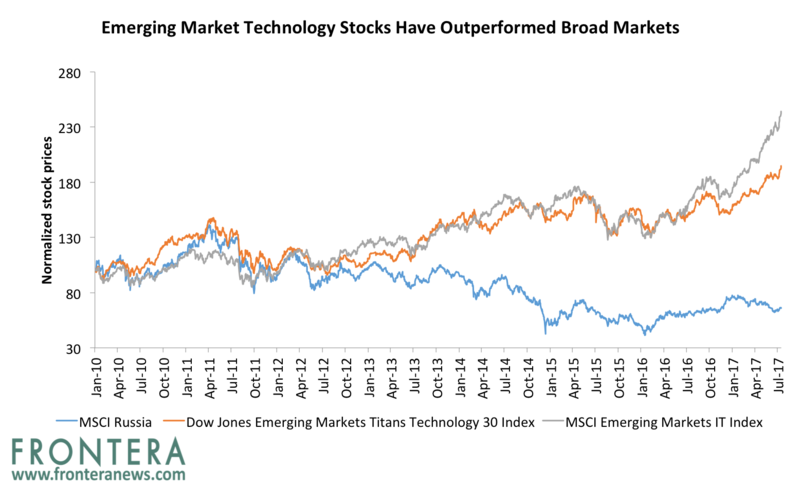 Since 2010, the MSCI Emerging Markets IT Index has surged 144% while the Dow Jones Emerging Markets Titans Technology 30 Index has gained 95%. 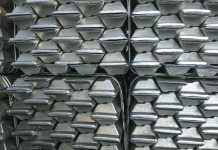 Comparatively, the MSCI Russia Index (ERUS) has seen losses of 34%. 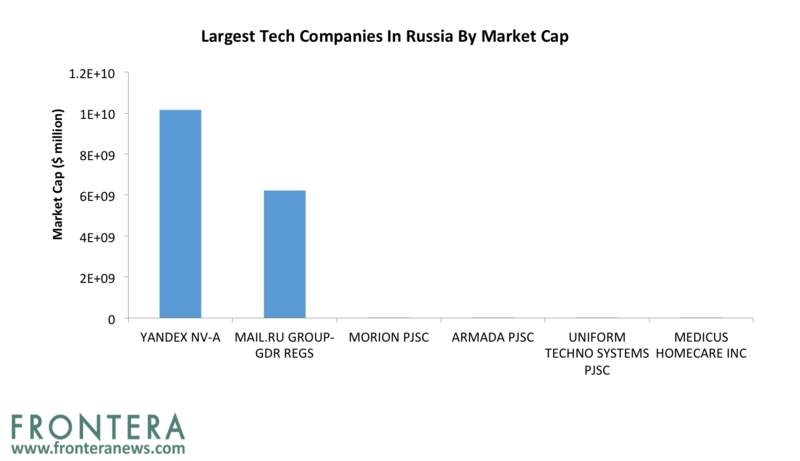 The largest tech companies by market capitalization in Russia are Yandex (YNDX), Mail.ru (MAIL.IL), Morion PJSC (MORI) , Armada PJSC (ARMD) and Uniform Techno Systems (UTSY). As illustrated in the graph below, Yandex and Mail.ru are in a league of their own. 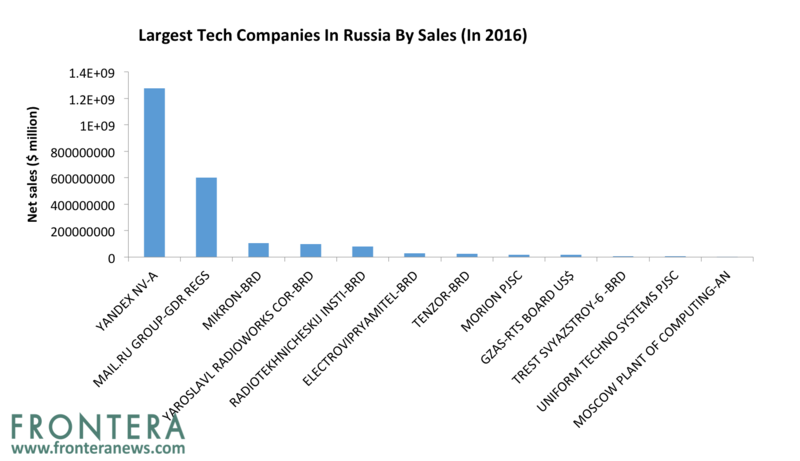 By sales (in 2016) the largest Russian tech companies are Yandex, Mail.ru, Mikron (MIKN), Yaroslavl Radioworks (YRSB) and Radiotekhnicheskij (RTIM). 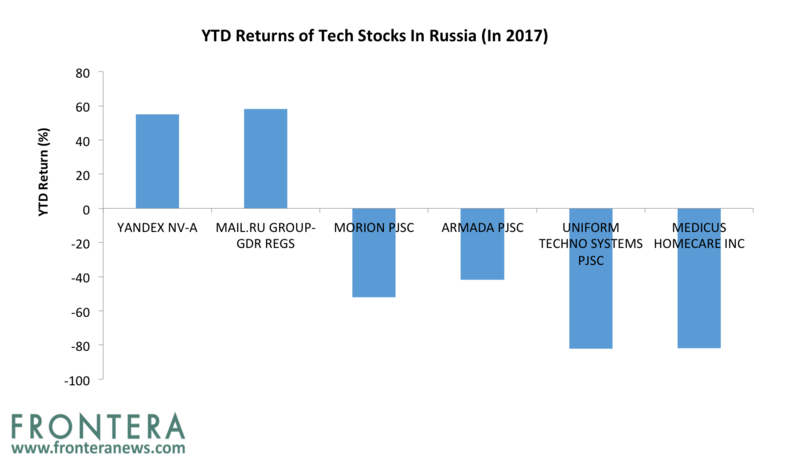 Year to date, shares of Yandex, Mail.ru, Morion PJSC , Armada PJSC and Uniform Techno Systems have returned 55.1%, 58%, -52%, -42% and -82% respectively. Yandex is the most popular search engine in Russia, putting it directly in competition with Alphabet’s Google (GOOG). Based on audience reach, Yandex had a market share of 55.4% in 2016 in Russia. Apart from its search engine, Yandex also offers services including an electronic payment service, a taxi-hailing app, and a cloud storage solution. In Russia, Yandex competes with Google, Mail.ru and Rambler (a private company). Yandex also operates in Belarus, Kazakhstan and Turkey (TUR) but still derives most of its revenues from Russia. In June 2017, Google and Yandex had market shares of 47.4% and 47.5% while Mail.ru commanded a market share of 3.3% in the Russian search engine space. But that’s likely to change based on a recent settlement with Google over an antitrust claim. 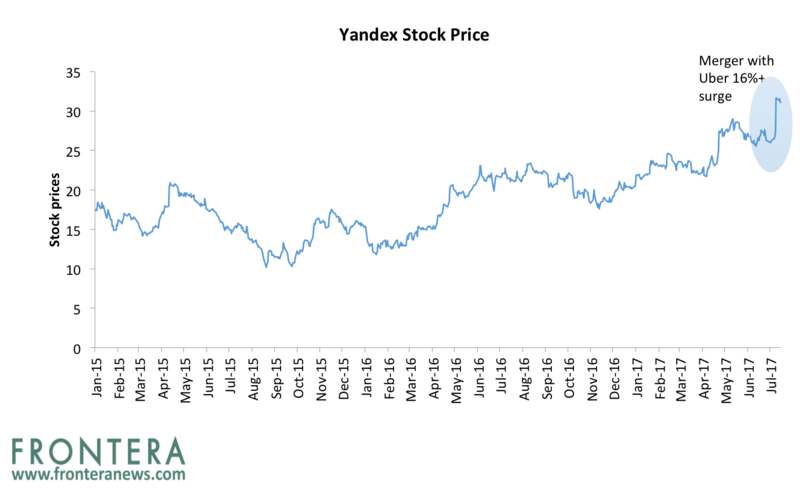 Yandex has been steadily amassing a higher market share after Yandex filed a complaint against Google’s anti-competitive tactics, forcing it to pay $7.85 million as fine. In mid-July, taxi-hailing service Uber merged its Russian taxi business with Yandex. Yandex will own 59% of the combined company after the merger. The merger is expected to give Yandex an additional 5% to 6% of the Russian taxi market. In 2016, the company reported a turnover of $1.3 billion, the highest among Russian listed tech companies. The company has a market capitalization of $10.2 billion. Publicly listed on the Moscow Stock Exchange (MOEX), shares of the company have gained 55% over the year so far. 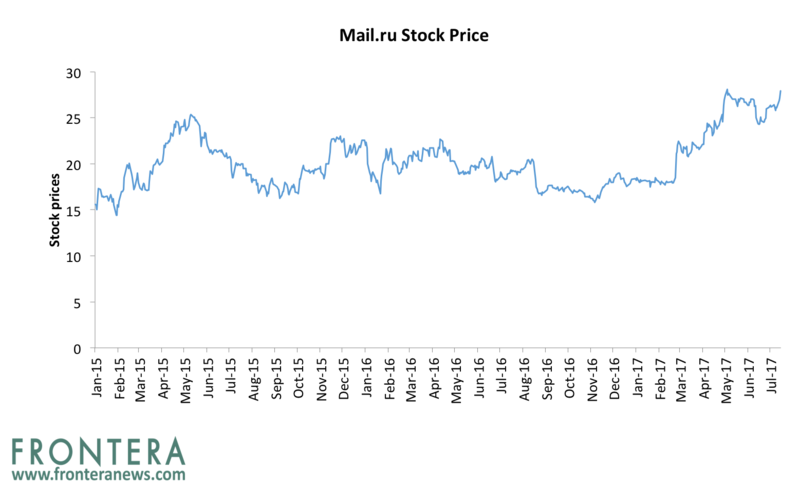 Mail.ru, established in 1998 as an email service has now grown to become one of the largest tech players in Russia with a portfolio of e-commerce, social networks, online games and cloud storage. The company also has investments in Facebook and Groupon. Mail.ru holds 100% stake in Russia’s most popular social network VKontakte and operates the country’s second and third most popular social networks Odnoklassniki and Moi Mir. It also operates two instant messaging networks (Mail.Ru Agent and ICQ), an e-mail service and Internet portal Mail.ru, as well as a number of online games. Websites owned by mail.ru have the largest audience in Russia and reach nearly 86% of Russian internet users. 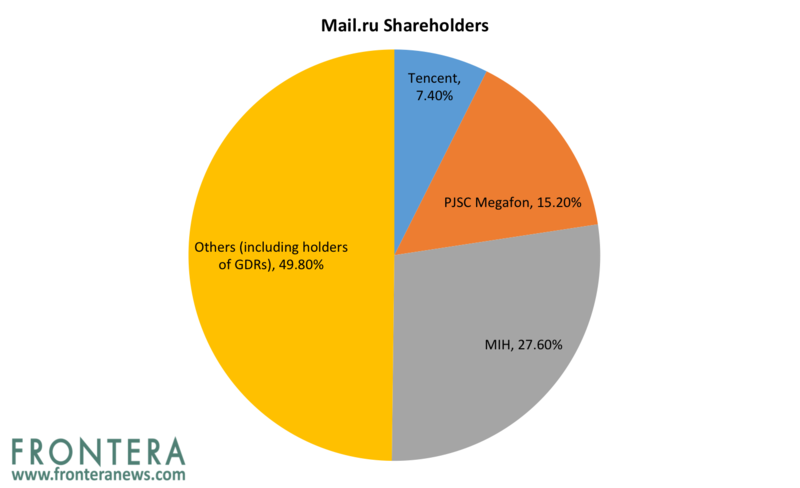 In 2016, China’s Tencent Holdings (TCEHY) had 7.4% stake in Mail.ru, while Russian telecom operator PJSC Megafon (MFON) owned 15.2%. Mail.ru is listed on the London Stock Exchange (LSE) and has a current market cap of $6.2 billion. In 2016, the company generated revenues of $600 million. Morion is engaged in the development, production and implementation of communications systems in Russia, Belarus, Ukraine, Tajikistan and Turkmenistan. Morion PJSC supplies its products to Russian railways, OJSC Gazprom, the natural gas company, OJSC Transneft – the Russian oil pipeline company and OJSC RAO UES – the Russian electric power provider. It also holds a stake in the Kamatel joint venture with Siemens. 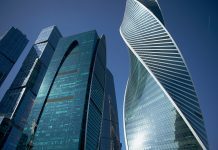 In 2016, the company recorded sales of $20.3 million (1.2 billion rubles). The company trades on the Moscow Stock Exchange and has a market capitalization of $183 million. YTD, shares of Morion PJSC have lost 52%. 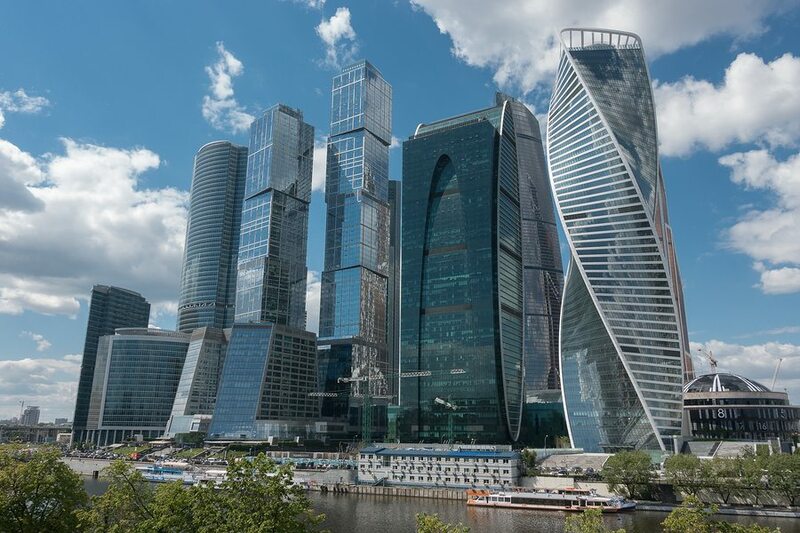 Sell side analysts remain bullish on tech stocks in Russia as they gain from high growth and rising consumption spending. Yandex has received 10 buy ratings, 2 sell and 6 hold ratings, while Mail.ru has 9 buy ratings and 2 sell and 5 hold ratings. Valuations within the Russian tech sector are stretched with average one-year forward PE ratio of 34x. 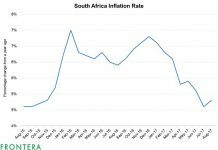 Uniform Techno Systems and Morion PJSC are the most attractive stocks based on their cheap valuations. These stocks have one year forward PEs of 7x and 5.7x and are trading at the steepest discount to their peers. 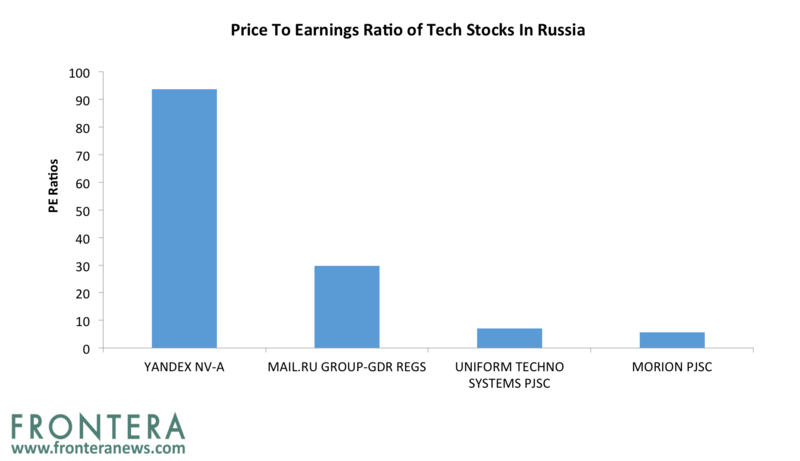 Meanwhile, Yandex and Mail.ru are the most expensive tech stocks in Russia with PEs of 93x and 29.8x, respectively. Previous articleWhy Is The International Community Not Intervening In Venezuela?